I suppose you could say that brawn combined with brains is unbeatable! The brilliant mind of Ross Brawn engineered the almost unbelievable inaugural 1-2 for the Mercedes-engined Brawn GP team, the previous time being 55 years ago when the Mercedes duo of Juan Manuel Fangio and Karl Kling demolished their opposition. Jenson Button drove a well judged race and deserved his second win of his career. There will be more, now he has a good car under him. Barichello also drove well, making up for his goof off the starting line, and the first corner clash with Webber. Ross Brawn’s cars are not only fast, they are very strong. He was a bit lucky to see the second and third placed cars take each other off three laps from home, to elevate him to second behind his team mate. To emphasize the dominance of the Brawn GP F1 cars, it should be noted that their 1-2 in qualifying was done at 664 kg and 666 kg (Button/Barichello), whilst Kubica (4th BMW) was 650 kg, Massa (6th) was 654 kg and Raikkonen (7th) 655 kg (Ferrari), Hamilton (15th McLaren) 655 kg and Buemi (15th Toro Rosso) weighed in at 675.5 kg. Buemi who came in 7th at his first outing in F1 deserves a mention. He drove an attacking race in a very average race car and beat his more experienced team mate (Bourdais) both in qualifying and in the race. The youngster has talent. The other young talent is Sebastian Vettel, putting his Red Bull 3rd on the grid after qualifying and running the entire race in what looked like a secure 2nd position, until three laps from home. At that point his inexperience showed when he tried to defend his position (on shot race rubber) against the much faster BMW of Robert Kubica (on good tyres). The resulting, and avoidable crash, put them both out of the race. Vettel receives a 10 grid places demotion for the next race in Malaysia. To compound his youthful indiscretion, he (and his team) also copped a $50,000 penalty for driving around on three wheels, trying to finish behind the safety car! Vettel’s more experienced Red Bull team mate, Mark Webber, was taken out on the first corner when Kovalainen (McLaren), Barichello (Brawn), Webber, Sutil (Force India) and Heidfeld (BMW) collided. The resultant damage putting Kovalainen out and making the damaged cars of Heidfeld and Webber uncompetitive. It is about time the F1 drivers learned that you do not win the race at the first corner, you only lose the race at the first corner. Lesson 1 from the Old Driver’s Almanac! McLaren’s Lewis Hamilton’s 3rd from starting position 18 was a sterling effort and does show the youngster is prepared to race, not just tour around in a quick car. The lack of performance in the McLarens will be keeping their design team working nights and weekends, but do not write them off. Ferrari had a weekend to forget, and despite two quick drivers, the Maranello red cars are currently not competitive. Massa’s car retired with a mysterious failure and Raikkonen admitted his driver error in scoring an unforgiving wall. Do not write Ferrari off either. Remember their debacle last year in Australia, and the nail biter of the season’s finish to lose the championship by one point. Toyota lost their qualifying positions having been judged to have illegal rear wings, but both finished well and in the points. Toyota will get that elusive win in 2009. Williams and Renault in the hands of Rosberg and Alonso ran strongly mid-field. In the hands of Nakajima and Piquet they were nowhere. Last week I asked what was the world’s first successful radial tyre? Hint - it was 1953. It was the Michelin X, and what a breakthrough that was! So to this week. The first manufacturer to produce a million cars anywhere was Ford in 1922. What was the first British car to sell over one million units? The lower price range was very well catered for with brands that were mainly Chinese, though Malaysia was also a strong player at that level. 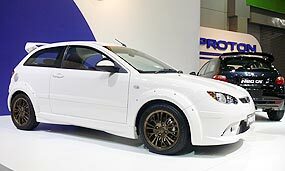 Proton from Malaysia had several models on display with prices as low as 399,000 baht for the 1.2 liter Savvy, available on a 5 percent deposit of 1,950 baht and repayments of less than 7,000 baht over 72 months. If you wanted to make the deposit 20 percent, repays can be as low as 5,391 baht per month. Small change. Whilst the Savvy does very little for me, the Proton Neo CPS is a wonderful little pocket rocket, which reminds me of the original Cooper S. Derived from a fairly pedestrian sedan, but looking great with wider wheels, bolt on flares, sporty interior, and the CPS also has a roof-mounted wing! It comes in only two colors - white and black. The white looked better. 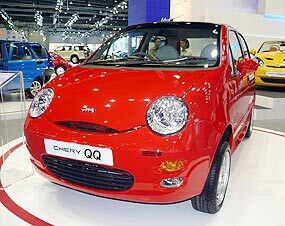 Adjacent to the Proton stand is the Chery, with its budget QQ (yours for only 379,500 baht) having pride of place. Looks quite cute from the outside, but don’t open the door, or you will have to face meters of cheap buff colored plastic. The Chery concept car (the Faira) looked like a scaled down Audi TT without the cleanliness of line, and had one of the most nauseating interiors ever, looking as if it was designed by Walt Disney on LSD. A Chinese import, which comes to Thailand via Malaysia, is the Naza Forza and handled here by the revamped Yontrakit Corporation. Not only is the price low at 389,000 baht, but the 19,450 baht deposit can also be split into 10 payments of 1,950 baht. However, like the Chery QQ, don’t open the door. 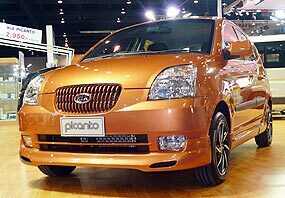 Also on the Yontrakit stand was the Kia Picanto, in which you could drive away by leaving a deposit of 2,950 baht. You spend more than that on a dinner and a good bottle of wine! 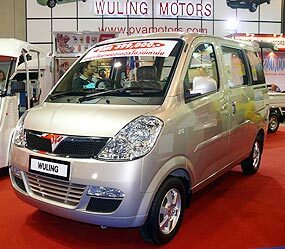 Still in the budget end of the market is Wuling, now in their third year in Thailand and represented by PVA Motors. The Wuling Scorpion small truck has been around for a while now, but at a show price of under 300,000 baht has to be a bargain in anyone’s language. And you don’t have to speak Mandarin. The Wuling Hongtu is a new seven-seater minibus, which is yours for 399,000 baht, definitely worth a look if you are in the hospitality business, with sliding doors on each side as well as the rear tailgate. The ‘green’ part of the show was covered by Toyota with a concept car called the A-Bat and their new Prius, and by Honda with the new Insight and Lexus with the SUV LX 450h. These were all hybrids. There were a few electric vehicles as well, but most of the enlarged open golf cart variety, and not practical as far as urban transport is concerned. If you are only looking for high end and exotics you will be disappointed in the main halls, as there was no official representation from Ferrari, Lamborghini, Maserati, Bentley, R-R, Porsche and the like. This is understandable in the light of the world’s economic woes. Who is spending 20 million baht to park at the side of the road these days? However, for all the Daniel Craig / James Bond fans, you can rent a black Aston Martin DBS from Master Car Rental people and impress the girls in several sois in Chiang Mai. However, your dream has a price - 455,000 baht rent per month, with a contract of five years. In the audio and accessories sections there were a few exotics, including Ferrari, Lamborghini, Ford GT, a wonderful black Nissan Skyline, Porsches, a Hummer H3 and even a Fiat 500. One manufacturer which had some really desirable vehicles was VW, represented by Thai Yarnon. 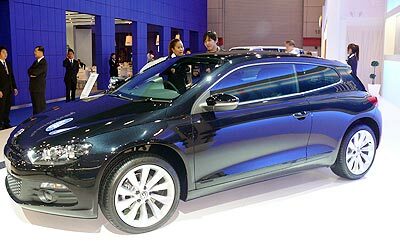 Unfortunately, they had the “new” (now old) Beetle at the front and it was easy to miss the very svelte black Scirocco. This looks like an enlarged Golf and would be my pick if I had to choose anything around the 2.5 million baht range. Far nicer than the Mini variants, for example. Along from the Scirocco was the new Passat CC, which at 2.59 million is any match for the BMW 3 series as far as looks is concerned. BMW had their usual large display with elegant women and cars arranged in rows, but lacking any imagination. The 1 Series is not just plain, it is plain ugly, looking like a 3 Series that had a head-on and repaired by a backyarder up-country who didn’t quite get it right. The new 7 Series was presented in white, with larger nostrils and the Bangle Bustle toned down. Nothing to go ‘gasp’ over, I’m afraid. More of the Bangkok International Motor Show next week, plus a rundown on the better motorcycles from the Isle of Man specialist Alan Coates.